Please note that this blog doesn’t reflect the views of my current or past employers. This short blog is in reference to a recent Welsh Government statistic on each local authority’s sense of “Welshness” which found that 80% of those surveyed in Merthyr Tydfil answered that they felt a sense of Welshness about themselves, which was the highest percentage compared to other local authorities. I was educated through the medium of Welsh where I was taught about the concept of Welshness (Welsh: Cymreictod). What I learnt was that having a sense of Welshness is more than patriotism and pride – it’s about celebrating the culture and sharing Wales’ culture with others. However, I learnt that the Welsh language is a crucial part of Welshness, as it is a major part of our culture’s identity. We were told “cenedl heb iaith, cenedl heb galon,” meaning a nation without a language is a nation without a heart. Beryl Griffiths explained through her poetry that “Welshness is a preoccupation, a political position, a form of dissent against the dominance of English culture,” which of course has a strong connection to Welsh history. Over the centuries under English rule there has been a constant struggle to be able to freely use the language – and some would argue that there’s still a hindrance by those over the pond! There are instances when those speaking their mother-tongue have been smug towards others, which shouldn’t reflect how people share or represent the Welsh language. From my own experience, I’ve been witness to native Welsh speakers being preferred in the Eisteddfod than learners while at the festival. Additionally, in recent years there have been some events which I’ve attended that brought to my attention of some bilingual attendees (broadcasting their orange coloured lanyards) who weren’t at all bothered in making any attempt to include non-Welsh speakers in their sessions. This doesn’t represent the openness of bilingualism as it causes exclusion, prevents the sharing of ideas…and it’s rude. Pure and simple. Another example in recent years where it was perceived that Welsh language is allegedly a waste of space is featured on Gavin and Stacey (The Boys Arrive. Series 3, Episode 3) when Dino made the effort to learn Welsh. He introduces himself to Gwen, Stacey’s mother, in Welsh but Smithy then cuts into the conversation and tries to explain to Dino that nobody around here speaks Welsh (referring to Barry) and then Gavin tells Dino to ignore all the Welsh signs. In my opinion I wouldn’t think that those who were surveyed recognised their sense of Welshness being in relation to the Welsh language, as present and historic evidence would suggest that there’s a lack of influence from the language in the area; 68% of the population in Merthyr spoke Welsh back in 1891 according to the Census. These figures gradually fell during the 1910s and then had a drastically declined over the decades. And as of 2011 it was recorded that less than 9% of the population spoke Welsh in Merthyr Tydfil. I believe that those surveyed in Merthyr Tydfil had instead considered that their sense of Welshness lies with different aspects other than the Welsh language. From my own observation and being a Merthyr boy myself I would stomach a guess that these alternative conditions to Welshness are: (1) the great sense of community including fundraising for charitable causes – even though being one of the most deprived areas in Wales! (2) our pride in the area’s history and heritage (3) the area’s link to the birthplace of socialism (4) and Merthyr being recognised for having some of the greatest athletes in sport over the years who have represented Wales. Images courtesy of National Library for Wales. 1st image – Mary Parry by John Thomas (1875). 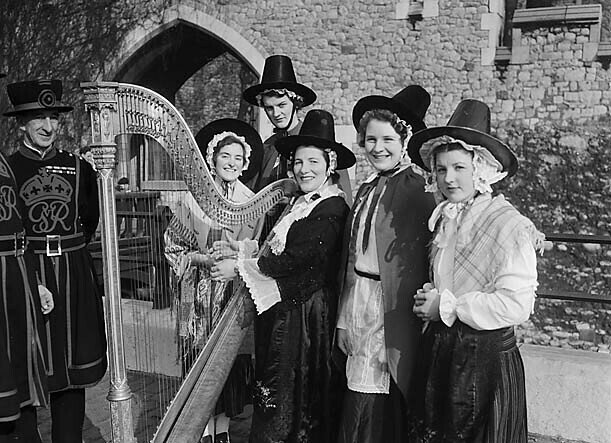 2nd image – St David’sDay Pageant in London by Geoff Charles (1953). 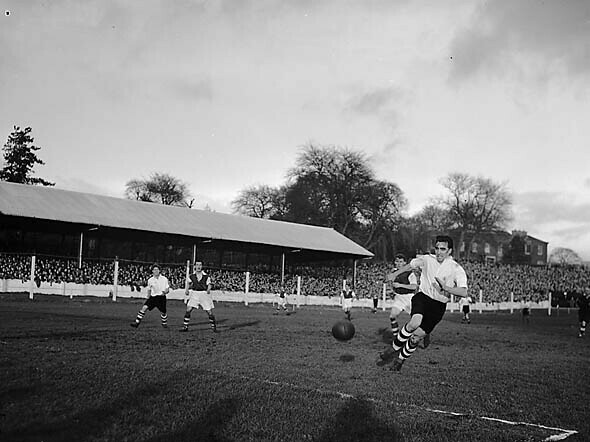 3rd image – Merthyr vs Ipswich (1951) No copyright known on all. Griffiths, B. (12/03/2018) Cymreictod. BBC Radio Cymru. Coincidently Shelter (now Shelter England) was formed months after the release of the television play and is still going strong in campaigning for families to have safe, secure and affordable homes. In terms of single people homelessness, Cathy Come Home did have an impact by influencing activists in London who had seen an increase in demand for support of individuals threatened with homelessness, which signalled the launch of CRISIS, an organisation that was formed fifty years ago this Christmas in 1967; the money that they raised that Christmas helped many of those facing homelessness or who were “living” on the streets. Christmas helped the organisation’s cause. This time of the year is when temperatures drop and further risk to individuals are heightened; exemplified with the current recorded deaths of people in Cardiff in the last few weeks and the average age of those who are rough sleepers is 47; yes, many of those who died had underlying conditions, but nobody can deny that their health didn’t deteriorated because they had no housing or weren’t able to monitored by our over exhausted and underfunded NHS. We think of Christmas as a time when you expect people to come together and help each other, and again perhaps this may have helped with the “success” (if I could call it that) of CRISIS’ formation, which I’m glad it did, otherwise we would have probably seen more deaths during the winter months of 1967 and the years that followed. Any time is the best time when helping or giving to people; compassion for your “fellow man” shouldn’t be decided by a flip of a calendar. 50 years on and the motto for CRISIS still reflects its objective – “Together we will end homelessness.” Their fundraising campaign “Reserve a Place” demonstrates how they’ve stuck to their humble origins, as the winter season does signal the public to dig deep into their pockets and lets them realise how lucky they are to have a secure, warm place they can call home. For my blog I will only be examining the support services provided by organisations for those at risk of homelessness in Wales, as I’m not well-versed in the services located in England. Devolution has meant that the housing sector in Wales is different from that in England. As I’ve written this blog to highlight the anniversary of CRISIS it only makes sense that my first organisation in Wales should be CRISIS Skylight South Wales, which has a Homelessness Knowledge HUB; a great education tool that breaks down the stereotypical barriers of the public’s perception of homelessness. Understanding that homelessness is not purely based on the bad decisions made by people but is the result from an array of complicated and underlying issues such as financial troubles caused by ill health, relationship breakdown, escaping ones abuser (whether mental or physical abuse), kicked out of the family home because of your sexual orientation, mental health illnesses or others. There may be a high number of people who have substance misuse issues but we shouldn’t be judgemental. Instead we should learn that there’s more to drugs and alcohol than simply addiction. What happened to this person to make him or her needing drugs? Yes, there may be a connection between substance abuse and mental health issues such as depression but understanding that the drug use was due to their mental health is only the first link.? If there’s a mental health problem such as depression, then what could have caused it e.g. the inability to cope with the death of a loved one? For 35 years Shelter Cymru have been the primary “people and homes charity in Wales” and have campaigned endlessly for people’s fundamental right to have access to a decent, secure home. Their advice services and campaigns have raised awareness of homelessness and the need for better preventative measures that would safeguard individuals and families from the homelessness, for example, one of their recent campaigns called “7 ways YOU can end homelessness” is about educating yourself, looking after yourself and others, doing your bit to help end the housing crisis, help people sleeping on the streets, campaign for change, give your time, and donating to end homelessness; I believe that these all tick the boxes when it comes to understanding about the realities of homelessness as it’s not just about fundraising, it’s about realising that there’s more to homelessness than being on the streets including the fact there’s a shortage of housing in Britain! Homelessness among young people and women has increased, which requires more demand for support services and one organisation that is dedicated to tackling this head on is Llamau; an organisation that began merely as a group of people concerned about homeless teenagers in the Vale of Glamorgan back in 1986. Llamau are always looking at ways of helping to end youth homelessness including their annual Sleep Out campaign, which invites people including volunteers and other organisation representatives to sleep outside together in order to help raise money and awareness. Of course the event’s not at all about replicating homelessness because those who participate are able to walk away any time they want and can go back to a warm and secure home. A few other examples of their continuous efforts to help young people at risk of homelessness is their newly launched campaign “End Youth Homelessness Cymru”, which sets out its objective for the next ten years. Also they have been raising money for a new “Youth Homeless Helpline,” a crowdfunding appeal to help launch the first out-of-hours helpline for young people at risk of homelessness in Wales; an essential service that should be supported not only because it caters for a vulnerable group of people but knowing that homelessness has no schedule, an out-of-hours service could potentially be a life saver to those struggling with the idea of becoming homeless. As I’ve already mentioned homelessness can be the result of multiple and complicated issues such as a break in a tenancy agreement involving the use of drugs; so instead of being understanding or concerned for their wellbeing, there may be landlords who won’t even bother accepting someone who they believe may have an addiction or a history of substance misuse. Therefore, it’s important to have an organisation that is able to support those with possible complex needs such as the Wallich, an organisation which doesn’t judge any of its service users and believes that they have the right to have a safe place to live while they are supported in rebuilding their lives. By reading this blog you’ve noted that there’s not simply one organisation that helps with homelessness, which can be confusing sometimes, especially to someone who’d like to learn more about how they can help or for someone who is potentially being threatened with homelessness; and that why the people of Wales has Cymorth Cymru. Cymorth Cymru is “the umbrella body for homelessness, housing related support and social services in Wales.” The organisation has many responsibilities and one of those is running the Supporting People (SP) Programme, a Welsh Government funded programme which funds services that provide support for those at risk of homelessness. However, unlike organisations whose services target a particular vulnerable group, the SP programme is able to recognise that there’s a multitude of people that are just at risk. In addition, I’m glad that the programme focuses on the social services aspect, as the threat is not just about homelessness but there’s a danger of people losing their independence and living in a limbo-like state from hospitalisation mainly in regards to older people, which has a devastating effect on their lives. Lastly, I want to highlight the work of Citizens Advice Cymru – Cyngor ar Bopeth. This is not just because I’m currently employed by the organisation but because I want to demonstrate how they were fundamental in the earlier days of housing rights and helping those who became homeless. The origin of the organisation can be traced back to 1939 at the beginning of World War II when it was called Citizens Advice Bureaux; when it was key in helping those living in Britain at such a turbulent time as there was a call for further advice and support including help with accessing food, homelessness through bombing or evacuation, and with finding missing relatives and prisoners of war. Throughout the years Citizens Advice have campaigned and raised awareness of people’s rights including issues relating to housing, which can be testified by the Rent Act of 1957 that saw one of the organisation’s biggest influx of clients through their bureaux’s doors. Citizens Advice is a key, reliable and open source for information. The organisation doesn’t shy away from directing you to another service that would be more suitable to help you in terms of providing further specialised advice and support. This is why I believe it’s a charity which needs to be included with the others in this blog. If you’re interested in learning more or want to volunteer for any of these organisations, then you can read about their current campaigns and opportunities via the links below. Thank you. Disclaimer: This blog does not reflect the views of my current or past employers. Image by Daniel Lobo. Public Domain Image (2013). Dead men tell no tales, so shouldn’t we help them? Only a few weeks had passed since I left my position at Amgueddfa Cymru – National Museum Wales but it was still good to see my former colleagues at an event that they were both hosting and participating in at Cardiff Museum. Telling tales is vital when trying to explain about an object’s past function and the relationship it may have had with its creator or user, which is important when educating the public and encouraging the next generation to discover more about their ancestors and heritage. The term interpretation is mostly used by academics and is associated with museums in regards to the descriptive process of objects, but in many instances (especially by past academics) they can seem to lack the ability to make those stories more relatable to the public. The word tale creates a sense of enchantment and encourages people to ask further questions unlike reading an interpretation that may only give a brief description; a tale can bring the legend of an object to life! Opening the conference was PAS Cymru’s very own Mark Lodwick as he welcomed the delegates and speakers, and thanked the organisers (P.A.S) and the funders of the event (Heritage Lottery Fund) for making this event possible. He then PASsed the mic to Lauren Speed of P.A.S UK who spoke about the organisation’s work with recording the finds onto a database which has over 1.3 million objects that the public could freely search; and she was happy to make note that many of these finds were recorded by volunteers. She wanted to invite the public to discover these objects online and to fill in the gaps in regards to information, background and any stories that could be told about these objects because the database allows the public to learn and to potentially have us learn from each other – with new information comes new story telling. Dr Rhianydd Biebrach, Project Officer for Saving Treasures; Telling Stories; a partnership project between Amgueddfa Cymru, The FED and PAS Cymru; and funded by the HLF until early 2019. Rhianydd spoke about the project’s on-going work including its involvement with community projects and various partnerships with local museums, groups and volunteers. One of these many successful partnerships includes the collaboration with journalist students from the University of South Wales that was exemplified by the videography and interviews on the Llanmaes hoard and the Swansea Bay Dagger. Rhianydd is a treasured colleague at the museum and if you have an interest in saving the nation’s treasures and want to help tell their stories – why not join the project and become a volunteer and a story teller? Natasha Harlow, a postgraduate student at Nottingham University gave a presentation on debunking the legend of the infamous Boudica (or Boadicea), Queen of the Iceni tribe. The very little evidence of her existence leads scholars to believe that she may have only been a figure created by Roman Britons for propaganda purposes, which made themselves look favourable by the rest of the Empire and to reinforce their control over the natives. So unless a chariot with the inscription “Boudica was here” is unearthed in Norfolk or the north-west of Suffolk then it’s impossible to say that she ever existed. Representing those from the metal detectorist community was Dominic Shelley, a self-recorder from Cambridge, who briefly discussed the history of Europe including the “polite” sacking of Rome, how the so-called Dark Ages weren’t as dark as most would think, and how the Visgoths of Gaul left behind traces of the Goths in Cambridge; and I don’t mean that they’ve excavated eye liner. I had never come across the term “P.A.S Guerrilla volunteer” until Stuart Elton has described himself as one, which apparently means that he’s involved in finding and correcting information on the P.A.S database. He has recently published a book on the lead bag and cloths seals with Archaeopress. Unlike an ordinary talk on the Roman archaeology Steve Guy-Gibbens, a volunteer at the Hampshire Cultural Trust discussed the work that he undertook when he investigated an object (Roman Phalera) in order to provide it with a form of interpretation for their collection. During his presentation he conveyed how important it was at being open about ideas when re-examining resources, in terms of working on the Roman Phalera and any other object for that matter; and also encouraging colleagues, other academics and enthusiasts about wanting to rediscover finds. Many of the delegates who attended the conference were volunteers and the speakers weren’t exempt as the next speaker, Simon Nicholson a volunteer for P.A.S from the Derby Museum gave a passionate presentation on the local history of Derbyshire. He began with Noah and his ark…no, not the biblical Noah! There was a local Noah Bullock, a “gentleman” who was caught clipping coins (forgery) on his river boat during the 17th Century; and then he told us about the origin of the term Derbyshire dollar which has a Spanish connection; and lastly he had pride when telling us about the region’s claim to early industrialisation and manufacturing including Derbyshire ware, which he described as “petrified yew flesh” that may not be the prettiest of pottery but it does the job. PastExplorers’ last two speakers, Emily Freeman and Evelyn Curl, were both striking the right note as they did a presentation together on the Shropshire Piano Hoard, which not only examined the hoard itself but the complications behind finding its owner and the surprise that they had with the unbelievable amount of international media coverage. Laura had commented on the theme of the conference and how it reflects the responsibility of those who are involved in the sector in helping to tell the tales of these “objects that share our world.” Perhaps some would think this only personifies these objects but arguably it’s about sharing the stories of those who’ve made, used or even worshiped these objects in the past. As pirates use to say, “Dead men tell no tales.” But why should that stop us from helping them the best we can? As someone who has an interest in the heritage sector I’m glad to have attended this event. It was lovely to have conversations with past colleagues and to meet new people, and I would recommend that anyone who has an interest in the heritage sector or is thinking about volunteering for a museum should attend the next PAStExplorers. Image courtesy of Internet Archive Book Images, University of North Carolina at Chapel Hill, “Both sides of the border; a tale of Hotspur and Glendower” by G.A Henty (1903). No known copyright. Being a Merthyr born and bred I grabbed at the chance to attend the design charrette held at Cyfarthfa Castle. Also, working in the History & Archaeology department at Amgueddfa Cymru – National Museum Wales, I thought attending this event would be beneficial for me in gaining an insight into how organisations cooperate on local heritage and afterwards I’d be able to report back to my colleagues on what I’ve learned. A public meeting or workshop devoted to a concerted effort to solve a problem or plan the design of something. A period of intense work, typically undertaken in order to meet a deadline. Storm Brian invited himself to the event, but his menacing nature didn’t dampen anyone’s spirit with over fifty people in attendance at the old gymnasium; all like-minded people who were interested in making the event a success for Merthyr Tydfil and its people. Out of nowhere came the loudest of whistles (provided by one of the organisers); a fitting entrance to the day. Did you know that the first ever steam whistle was invented in the Dowlais Ironworks by Adrian Stephens? (An early example of his work can be seen at Cyfarthfa Museum). Carole-Anne Davies of Design Commission For Wales (DCFW) thanked everyone for coming to the charrette and asked that before the day begins to hold a minute silence to remember those who died in the Aberfan Disaster (21st October, 1966). Cllr Kevin O’Neill told a brief story regarding Mr Glyn Gibbon, who had recently passed away aged 90, and how as a young man he went to British Columbia in Canada and had stumbled upon a steel bridge marked Dowlais; signifying the influence of the local area on the world. Being a genealogy hobbyist myself I found Cllr Geraint Thomas’ presentation interesting as he showed the link between the ironworks and his family tree. This kind of knowledge does create a personal connection to a place and is another aspect of how local people can celebrate their industrial heritage; many local families have a sense of pride about their ancestors’ life in these notorious ironworks (I like to think that we, Merthyr people, weren’t born with silver spoons in our mouths but with iron in our blood). The success of the ironworks in the earlier and middle parts of the 19th Century gave rise to the town’s population growth, which meant that in the space of 60 years the town’s population increased tenfold! Crawshay had “God Forgive Me” written on his tombstone (in Vaynor Cemetery) which has become an object infamous with local legend. And it still creates rumours and divided opinions including whether Crawshay wanted God’s forgiveness for how he treated his workers in the last years of his life or for cheating on his wife with other women and then not acknowledging his illegitimate children. However, from a historian’s point of view, Hefin believed it only to be a Victorian custom. To explain why we needed a charrette and why in Merthyr Tydfil, Geraint Talfan Davies OBE had to firstly inform us of his background as Chair of a housing association, which had him campaign against the destruction of The Triangle in Pentrebach (originally housing the families of Plymouth ironworkers), even though the houses were grade II listed they were already “earmarked for clearance”[i] and demolished in 1977. This is another part of our industrial heritage and social history that we won’t be able to dig up! He continued to talk about Gwyn Alf Williams, the Welsh historian, and how he campaigned for the Merthyr’s story and controversially how he thought jobs in Wales would consist of “wine waiters and museum attendants!” From a resident’s point of view I thought that this maybe an improvement since there’s hardly any jobs whatsoever! In his finishing statement, he believed that this event would help to “bring alive Merthyr’s ghosts,” meaning that we could bring back the heritage we lost or parts that are at risk of disappearing and would help to tell their stories. Our task leader was Matthew Jones of Coombs Jones (architects + makers) and currently a senior lecturer at the University of the West of England. Lisabeth McLean of Canolfan Soar and Menter Iaith Merthyr Tudful, which looks at “promoting the use of Welsh on a community level.”[ii] She highlighted the importance of the Welsh language in local heritage, to which I agreed, as it’s a part of our history. Furthermore the Welsh Government’s 2050 vision for a million speakers will help solidify its future in the landscape. Did you know that over 68% of the population in Merthyr in 1891 could speak Welsh? But it was revealed that only 8.9% could speak Welsh in 2011 Census. Ceinwen Statter, a Trustee of Merthyr Leisure Trust Ltd., told us how she came back to the town 10 years ago after moving away for 40 years for work and family reasons. Her local historic knowledge was extraordinary – a human encyclopaedia of Merthyr! Adding another architect’s perspective to the group was Biba Dow of Dow Jones Architects, who is based in London but was looking at projects in the Cardiff and the wider area. Thanks to her we had our strong vision for Merthyr Tydfil – “Unlocking Our Legacy,” as she identified from our stories that there’s so much history in one town which didn’t only point towards historic buildings, for example, there’s a history of sport, music and literature in the town. Richard Essex from Regeneration Skills Collective Wales (RSCW) has forty plus years in regeneration in the public, private and third sectors, which was beneficial to our efforts in regards to revitalising our heritage that was abandoned due to a lack of funding and interest. Rhian Hâf’s presence was essential. As an artist (Glass Maker)[iii] from Caernarfon in North Wales it was interesting to see her concept of how we could link these historical sites together. She recognised that there’s an occurring theme in South Wales with trails (She constructed the diagram that we presented to everyone, which highlighted the heritage trail of the town with the re-introduction of the old tram). How can we draw on Merthyr’s landscape and built heritage to become a world class visitor destination and experience? This was the question put to everyone and was the first task of the charrette, which was further explained in the papers given out on arrival at the castle. Also, there were helpful suggestions in the programme which could support the brainstorming session including a brief on a SWOT analysis, examining themes and visions, encouraging sketching and diagrams, and more. Here are a few weaknesses that we pointed out in regards to the borough which could have a negative impact on our vision for Merthyr’s heritage. There isn’t much awareness or support for people with a physical disability on accessing these sites. Biba highlighted the work that Rural Wales is doing to make trails and areas more accessible for those with a physical disability and mobility issues. There isn’t enough suitable and affordable hotels that could accommodate visitors. Marketing for activities and heritage attractions aren’t reaching a wider audience. We have great branding that supports the town including “We Love Merthyr,” “Iron Heart” (by David Appleyard) and “Merthyr Rising” (by Hwyl Hub), but this isn’t reaching people on a national and international level. * There has been negative press of the town lately with Valley Cops, which focuses purely on the issues that every place in Britain experiences. This kind of media coverage has the town branded in the worst light and pushes us backwards in terms of progression, so every time somebody Google’s Merthyr Tydfil they’ll see the BBC One’s depiction of the town, then nobody will want to invest in it! Local bus services are almost non-existent after 6 o’clock in the evening; presently limiting what residents and visitors are able to do now! Also, the removal of the tourist information shop near the bus station doesn’t create a welcoming impression to visitors. The bus station is one of the key places where tourists are able to find out more about a location. There’s a lack of education in schools regarding Welsh history and local heritage! The new college should get more involved in the heritage sector, as conservation and reconstruction skills are highly sourced. * Ceinwen did point out that the Pontmorlais Scheme encouraged pupils to learn conservation techniques and to hopefully inspire them to carry on traditional skills. Bilingualism should be promoted in present and future heritage attractions. Giving local people the skills to tell their story would help in collecting local history and could act as a way of improving community participation in area. Additionally, it would create a sense of pride for those involved when they share their local connection through their own past or family’s story. * Casgliad y Werin Cymru – People’s Collection Wales is a prime example of being a collective database for the public in Wales to input their stories. The Voluntary sector has a big presence in the borough. Although, the cuts to charities has had an impact on the services they provide to the community. A key strength is that the people of Merthyr support their community and are great at fundraising for local charities and causes, which is exemplified with Mia Chambers’ “Rainbows Warrior Princess” campaign to raise funds for her to have treatment in America. We’re from Merthyr, we’re not use to thinking big! We were encouraged by DCFW and local councillors to “think big” with our ideas, as most groups including our own must have been concentrating on the social issues that faced the borough (and Wales) rather than what could be. * I’d say that this could be attributed to how Merthyr people think. As a people, like many Valleys people, we aren’t encouraged to “think big” with ideas. Lisabeth had an excellent idea on using our heritage as a platform for the art and dramatics, as she suggested that the Cyfarthfa furnaces would be ideal as a theatre with the space being great for both acoustics and lighting. Getting international visitors from those in the Welsh Tract in America and from Donetsk (originally Hughesovka) in Ukraine would be profitable for both the local economy and tourism industry, which was voiced by Ceinwen, as she thought it was important to establish and strengthen ties overseas with Welsh descendants. Why don’t we have the Eisteddfod in Merthyr Tydfil? We held it in Merthyr back in 1881 and in 1901. If we’re celebrating our heritage, promoting bilingualism and encouraging international relations, then wouldn’t this prove successful for the borough and be an example for our neighbouring valleys to follow our lead? Installing an old fashioned tram in the town was a suggestion that received much praise during the group discussion. We linked this to transportation in the area and how both bus and train services should advertise and possibly lead to the tracks of the tram, which would take visitors on a trip that could run through the town, like it was before, or optimistically the tram could follow the original route of the old Merthyr Tramroad. Like the Taff trail there should be a Heritage trail which outlines all the heritage sites from Cyfarthfa Castle to Pont y Cafnau. Perhaps the heritage trail could show the loss of our local heritage via VR technology (including The Triangle, the Old Railway Station design by Brunel and others)? * Richard explained to us how he attended a heritage event in England that used virtual reality glasses that helped to interpret iron aged monuments. I think that we all benefitted from attending the charrette. Although, I’m not sure our fingers and toes did (very cold!). I hope that the ideas generated would be able to support future heritage projects in the area, but more importantly, any project in Merthyr should have the interest of the people of Merthyr at its heart! Nid cadarn ond brodyrdde! I just to clarify that I went there, not necessarily as a representative of Amgueddfa Cymru- National Museum Wales, but as a citizen and keen blogger with an interest in the public sector and citizen participation. On the other hand, it would be absurd to think that I wouldn’t be networking with people involved in the heritage sector! Heritage is for everyone! Awareness was the biggest hurdle to jump over. Perhaps knowing who to sell the idea to would be more productive in spreading awareness? Targeting those who want to be targeted (to get involved) can be done through research on former participants, which would enable the organisers to grow participation, which Dave McKenna, a Public Servant, pointed out – You need to get to know your audience! Of course being a “Hack Day” there would be a strong digital element. However, Sara Long, a Welsh Clinical Leadership Fellow argued that those who may want to participate aren’t necessarily the ones who know how to code or may not be computer literate – so how could they contribute to this event? DXW’s Vanessa Williams hit the nail on the head when she said that diversity and inclusion was the key to participation, especially when promoting the NHS; it’s important to have a different perspective and the use of a success story would make the support for the event go even further – People want to relate to something they care about. Nathan Williams of ProMo-Cymru asked the group, “How does engagement save you money?” which was answered with “don’t sell a bad product!” (Well, that’s not exactly what was said but close enough). This question may follow the rule of thumb of good practice equalling good engagement, but I’d like to think that there’s more to this question in this digital age that we live in. There are definite current global barriers. Yes, we’re talking about Brexit. There were concerns over staffing capacity in the NHS, the danger of cutting off communication and having a lack of digital support, and the hindering of advancements in new technologies which could potentially save lives! I briefly mentioned the issues faced with patients, surgeries and NHS services in rural areas. There are multiple factors which stop people from attending including the residents’ lack of broadband service (making them less likely to attend), the lack of health board cooperation and the lack of access to methods of transportation – How can we have a digital revolution without basic internet access? Also, as this event would concern the Welsh NHS would there be by any change a language barrier? Though the numbers were small for this session, it gave Gareth Morgan (Benefits Information and Advice Specialist) a perfect focus group full of “key players” who are interested in the Welfare Reform; what I mean by that is they want to support people who have been subjugated by the government’s introduction to the dreaded Universal Credit and government cuts! We had Emma from Trivallis and a Trustee at Shelter Cymru; Annemarie, a GP (from 1st session) who feels obligated to help her patients – the impact from stress alone has a devastating effect on a person’s physical and mental health; Sarah from Tai Pawb’s Open Doors Project would be aware of concerns from private tenants; James from a housing organisation and who was in tune with housing policy; and then there was me, formerly of the national voice of tenants in Wales – Tenantiaid Cymru – Welsh Tenants. Gareth highlighted recent DWP research outlining that claimants were less likely to seek support not because they’re too proud or considered “handouts” as charity, but because of 1) not knowing that they’re entitled 2) they believe it would affect the money that they receive 3) and they may find the process too difficult or stressful. 1) The money comes directly from Westminster and not from the main pot in Wales. However, some work argue that this strengthens the leash around the corgi’s neck (and I’m not talking about the ones that live in Buckingham palace!). 2) The money would make a positive impact for the local economy as people have the tendency to spend locally, which supporting local companies and start-ups. Even though I’m all for local investment I don’t think that those who claim would perceive it as simply supporting local businesses. They’ll see it as having no other choice! They won’t be able to afford to go anywhere else due to their inability to affordable transport and other barriers that relate to the rising costs that continue to crash against the cuts to their income. We spoke about the impact of the removal of Communities First*, which James described as a “vacuum” as its sudden demise has cleared away any safety net that was established from supporting our most vulnerable in our society. And now there’s a task to build up the trust that’s lost and to fill that void left in the community. We were questioning whether there were any government plans that would act similarly to CF*; this is when I forgot to mention the 3Es – Employment, Early Years and Empowerment, which I’ve written about in a blog[i] from last year. Existing services have had to take on extra responsibilities, as cuts to local government has meant that it’s more common for local authorities to transfer those in need of support to other organisations, which may not even be local, as some charities have had to close their facilities and relocate. Claimants are more likely to trust the “man in the pub” instead of an expert in regards to legal or benefits advice. This is because they regard experts as people who have the best interest of the organisation or local government – and not them! Session 3) Universal Basic Income – Should we be thinking about it? The principles of Universal Basic Income* were covered at the beginning of the session, led by Neil Tamplin, to inform attendees of what were its objectives and potential if it were distributed. There was a strong consensus that UBI* would prove positive for the economy in a number of ways including creating opportunities for long-term volunteering, which would have economic benefits as people power suggests that there’d be less spending on resources. We should think of Universal Basic Income as a way of encouraging people to work as it would give them a sense of freedom, whether to re-train in a new skill or to volunteer in their community. UBI would act as a safety net and could, for a lot of ordinary citizens, give meaning or a new lease of life besides focussing mainly on work or being a full-time carer. There was an overwhelming sense that UBI would be beneficial to people’s wellbeing. For example, artists aren’t able to channel their creativity in a 9 to 5 job or when they are juggling multiple jobs that doesn’t support their passion; they’re reliant on these 9 to 5 job/s only because it fixes the bills and helps to clear some of the ever rising debt. Do we just exist and not really live life until it’s too late? Dyfrig Williams, now living in the west country, suggested that hindrance of UBI as an actual universal (well, worldwide at least) support and fair system may stem from the arguments made by right wing and conservative moments; these income puritans and their corporate followers believe that the global market would not be able to adapt from such a move and would link this to a communist way of thinking. Argumentatively, James said that these corporate entities get rich from braking the back of their workforce (who are some of the poorest in our society too!) and they still refuse to inject any of the money back into the country. The lack of distribution of wealth from Silicon Valley needs to go to those who need it and are owed it in other valleys – especially the south Wales valleys! Terminology & ideology may be the biggest obstacles for UBI, as it was suggested that UBS (Universal Basic Services) would override the idea of UBI, but this didn’t sit well with the group, as “services” imply that there’s a degree of control, a possibility of corporate influence and has a capitalist approach instead of representing the people. Laumiere stated that the word “income” would imply “choice.” Similarly, Gwenda Owen voiced her anger towards the loss of the term Social Security, which has been jargonised and “governmentised” with Welfare Reform – Has the true meaning of social security vanished in 21st Century Britain? Do Housing Professionals Want A Revolution? The group noticed a few representatives from the housing sector including Neil, who works in housing and who pitched this session, which got people (humorously) asking if the housing sector in Wales would be formulating a coup that would flip the coin on capitalism, so it would land on social reformation, or as Gwenda puts it – “come the revolution.” I commented by saying that the role of housing associations has changed tremendously over the years, especially in Wales. As less and less councils own units and have less resources to provide services it has meant that HAs have taken on more responsibility, which pressurizes social landlords to become more social in their community. I do like Gwenda’s push for change though. Maybe she’s right? The revolution starts at home! Because I would be attending a “design charrette” the following week (blog coming soon!) that will explore the industrial heritage of my hometown, I thought that this would be the perfect opportunity for me to get an insight into the digital aspect of the heritage sector, and how it could be beneficial for Merthyr Tydfil’s heritage now and in future. The group had the perfect brains to prod from both a heritage and digital marketing point of view including Wyn Williams of Dai Lingual (who provided the event’s bilingual translation); Huw Marshall, an expert of marketing bilingual digital content and who runs social media’s “yr awr Gymraeg” (the Welsh language hour); Dafydd James, Head of Digital Media at Amgueddfa Cymru – National Museum Wales*; and a staff representative from Cardiff People First who spoke about the engagement of service users in regards to digital heritage including their work on the “museum takeover day” and with the Ely hospital project held at the Cardiff Story Museum; and other individuals with a digital or heritage background. One of the biggest obstacles was the fact that they had no resources to appoint someone who’d be able to travel to give advice, which indicates that digital communication is currently their only method of reaching out to people! Huw questioned whether their marketing was at fault; why doesn’t the content reach the right people or why isn’t it able to reach a broader range of people? Couldn’t the NLW take advantage of Wales’ industrial heritage? Genealogy and DNA testing features on such programmes as “Who do you think you are?” which has been successful in promoting the subject and encouraging people to do family research. Could this help to market the collections better? Many people here and overseas including America have roots buried in the landscape. The NLW should now be opening its fortress of digital archives to the family historian or genealogy hobbyist (like myself). For a different perspective other than NWLs digital platform, the group discussed of others that could be relevant to the heritage sector including HWB meaning hub creates a safe online learning experience for children in schools when examining archival material; Unsplash, a digital platform which caters mainly for graphic designers by providing high resolution images is something that NLW could possibly tap into; Hacio’r iaith, a bilingual digital platform which has built up a community that “explores how technology applies to and through the Welsh language. [ii]” These discussions proved useful; it was proposed that another organisation/ company could be responsible to deal with the marketing and take over the NLW’s digital platform – this got Illtud’s wheels turning. Illtud highlighted the volunteers supporting the transference of hardcopy archives onto their digital database. Maybe appointing volunteer digital champions would help to connect NLW and the digital community? Angharad from YLab made a great point when she said that “nostalgia is a powerful tool” and that NLW should start with this. Illtud highlighted the work that the NLW has done with the BBC on the project supporting people with dementia connected to memory-loss in bringing memories alive. As the unconference came to a close the volunteers, the organisers, the sponsors and supporters were all thanked, which included those who attended, like myself, because an unconference can’t go ahead without any people “to conference” it (if that makes sense). Perhaps an unconference for the public sector would now be more associated with an out of chaos comes order reference, as the ongoing cuts and struggle would reflect a need for change. Again, I’m reminded of Gwenda’s push for a revolution! Viva Catalunya! Annibyniaeth i Gymru! Image Courtesy of Llyfrgell Genedlaethol Cymru – National Library of Wales. “Dog with a pipe in its mouth “(c.1940s) by P B Abery. Is there a museum in the house? Dr Young is the Honorary Research Fellow for Cultural Heritage and Museum Studies at Deakin University, Melbourne. She was invited to speak on her newly published book, Historic House Museums in the United States and the United Kingdom; A History. Also, to discuss her background and the research that led her to writing the book. We learned that her time spent cataloguing and preserving the historical objects of Samson House, Freematle in Australia, an indigenous intact house museum, from interpreting household items to taking care of the flora made her question “what does all this stuff mean?” which led her on the quest to further study house museums. She opened up about suffering from “museum deprivation” while working on her other book (at the time) and decided to volunteer at Blundell’s Cottage, where she served as the Chair of the Cottage Board. The types of house museums in her research included the Hero’s house, a property which would have been occupied or is relevant to a famous person’s life or work, and the Collector’s house, which showed off the super-rich person’s wealth through collecting or when a self-made rich person collects items in order to fashion “an adorned house” to create a memorial to themselves. I was particularly keen to learn about the hero’s house. I discovered that the life occupancy of such a property was not common, particularly by the famous person, and the process of their “museumization” is mostly associated with the link of these properties to the famous people’s lives, for instance; the patriotism of Americans makes them consider the many houses of George Washington as shrines, which creates a pilgrimage for homemade tourists. Even Dr Young confessed to being overwhelmed by Jane Austen’s House Museum. In relation to this particular “species” of house museum I’m ashamed to say that my colleague actually needed to remind me of my hometown’s local hero’s house – Joseph Parry’s Cottage in Merthyr Tydfil. The cottage itself was his family and childhood home. It is this link that makes the cottage a hero’s house. Both exterior and interior decor reflects the mid-19th Century Victorian home, which helps to interpret the conditions of the houses and social lives of the town’s ironworkers and their families during this period. Dr Linda Young, (2016) Historic House Museums in the United States and the United Kingdom; A History. Rowman & Littlefield Publishers, USA. I started researching my family history almost 15 years ago and became rooted in curiosity ever since. I have yet to find a “key ancestor” I’m afraid, which is not to say I haven’t found interesting stories; I discovered that my x2 great grandfather was born on the Red Sea and sadly one of my x2 great uncles was tragically killed due to wearing his scarf! For this blog, I’ll be focusing on the Donovan family, on my mother’s side, which I guess starts with me; although I’m not a Donovan per se, I want to briefly mention that I was born “out of wedlock” and my birth name was registered as Jonathan Donovan (yes, I’m aware that it rhymes). This family settled in Wales during the late 1840s from Cork, Ireland. I’ve traced the Donovans back to John Donovan (born 1848) from who I am descended through his son John Donovan and then his son, my grandfather, John Donovan. I hope the repetition isn’t too confusing. 1881 Census. Courtesy of the National Archives. I discovered that I’m one generation away from applying for an EU passport, as your mother or father needs to be the 3rd generation of a (now) EU country e.g. Ireland. With research it’s near to impossible to go back so far without a key ancestor, as most records only go back to the beginning of the 19th century with the introducing of the England and Wales Census which began in March of 1801, when the Census Act also known as the Population Act received Royal Assent in December of 1800; this did include Scotland, however, from a genealogical point of view it must be highlighted that a census was already recorded in the country as far back as the 1750s. Ireland, which was part of the British Empire at the time was not included in this until much later in the 1820s. It is difficult to fully research Irish records as many have been destroyed but a benefit with Irish surnames is that they act as homing beacons and are associated with clans or septs (subgroups or families whose allegiances are with a more prominent family). This is by all means no quick fix solution to researching family history, as surnames don’t reveal anything about the history of individuals and their lives. The history of Irish surnames can be associated with the Penal Laws in Ireland; these were a series of laws that forced mostly on Irish Catholic families to accept the reform denomination set by Anglican Church of England. Additionally, they were in place to discourage of the use of the Gaelic language and even encouraged the Anglicisation of old surnames that would use systems like “O” meaning the “grandson or descendant of”. Later on there would be a high number of families altering back to older spellings with the rise of Irish nationalism during the mid and late 19th Century. But, in terms of genealogy, this is irrelevant as old surnames are distinguishable from others and are evidently deeply rooted in the country’s landscape. Donnabán was a 10th Century ruler of the kingdom of Uí Fidgenti; an early kingdom located in modern day Munster and mainly situated in county Limerick. He was killed by the famous Brian Boru, High King of Ireland in 980 A.D, which caused the Donnabán sept of Uí Chairpre (a part of Uí Fidgenti kingdom) seeking refuge and being displaced over the next few centuries. This resulted in a long-term feud between the O’Donovan and O’Brien families for centuries! The last member of the Donovans to be styled king was Amlaíb Ua Donnubáin (or Olaf O’Donovan in English). He was killed in 1201 A.D by William De Burgh, the Anglo-Norman, and by the sons of Domnall Mór Ua Briain – who all belonged to the O’Brien dynasty. During the hordes of Viking raids in the 9th and 10th centuries in Ireland, of course there would have been some influence from these invaders, who would later settle and integrate with the native peoples; the Donovans’ (or O’Donovans) association with Ivar of Limerick, the last Norse King of Limerick, would result in the family having kinship with the Nordic royal dynasty Uí Ímair (meaning Dynasty of Ivar); though this would refer to Ivar (d.873AD), styled “King of the Norsemen of all Ireland and Britain.” This is where that Viking link comes in. The Vikings truly had an influence on the Donovans since they’d go on to use Nordic and Danish names for the next three centuries or so. I hope to keep on discovering more about things about my Irish heritage through genealogy and perhaps one day will return to the land of my mother’s father’s father’s father – and so forth!